Just Completed and Delivered to the University -- A Prosperous Educational Institution. 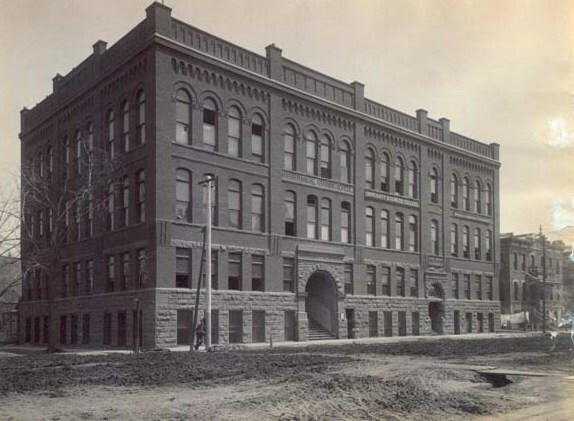 Professor J.C. Shattuck, who has had in charge the construction of the addition that has been built to the Haish Manual Training School of Denver University, has completed the same and turned it over to the university. The main building for the manual school was built at a cost of $25,000, the gift of Mr. Jacob Haish of De Kalb, Illinois. It is 40x73 and three stories high and has a basement. Mr. Haish attended the commencement at Denver University last spring and was so well pleased with the school that he told Bishop Warren that he would give the university $15,000 for the medical department if that would be sufficient to build upon the vacant ground adjoining the manual training school. The offer was accepted and Professor Shattuck, then Dean of the university, drew on Mr. Haish for the amount and began the erection of the new addition. It is built of brick and is three stories high with a basement. This makes a total gift of $40,000 by Mr. Haish to the university. In the basement is the gymnasium, which is one of the finest and best furnished in the West. In the first story is the medical lecture room. This is in the front room and in the rear is the pharmaceutical department. On the second floor in the front room is the Dental College, in the rear of which is a part of the rooms used by the Commercial College. On the third floor is the amphitheater of the Medical College. Here lectures are also given, but the regular dissecting rooms are not connected with this building. In the rear of this amphitheater is a reception room for the professors and the medical laboratory. This new building is a great help to the medical, dental and commercial colleges of the University, all of which have a large attendance and no university in the West affords such excellent facilities as these three departments of the University. The fact that a non-resident should be so liberal to education in the West makes this gift all the more appreciated. All the departments of the University and the collegiate also are now in a prosperous condition and Denver now stands in the front ranks of Western colleges.